Rescue the hapless manservant from a beautiful Daedra. Spurned Peak — Release Stibbons from the clutches of the Winged Twilights. Save Stibbons from the claws of an obsessive captor. I found a hastily written note from Lady Laurent's servant, Stibbons. He was captured by Daedra after we arrived in Coldharbour and is being held in a nearby tower. Read the Hastily Written Note. Find Stibbons and kill Drasilla. Go to the Shrouded Plains Wayshrine. North of the Moonless Walk, you can find a note on the ground. Read it to see what it is about. "Our trip to Coldharbour has gone somewhat awry. I do hope this doesn't prove too inconvenient for dear Lady Laurent. She so expects things to go smoothly. I find myself separated from the others and in the clutches of extremely beautiful Daedra." 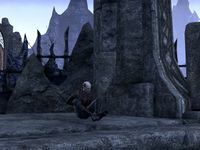 "The Daedra have been polite so far, if not a little lascivious. Still, I'm not sure that I can fully trust them. They hold me within a tower. I will continue to write these notes and drop them from my window until I am rescued. Once you decide to save Stibbons from daedra, you will receive A Moment of Your Time? in your inventory. Follow the winding path up towards the tower, along the way you may find two additional notes; If I May Beseech You and Situation Becoming Urgent. As you approach the tower, you will start encountering its' denizens, a variety of Dark Seducers (Predators, Warriors) and Winged Twilights. The interior of the tower will contain much of the same, so fight your way through and ascend the spiral stairs, as you reach the top you can find the final note, Prompt Rescue is Imperative. At the top of the tower you will find a tied-up Stibbons, in the centre of the room is his besotted captor, Drasilla. When you approach her she will cry out, "No! Stibbons is mine! You won't take him from me!" and start attacking. She has the same abilities as an ordinary Winged Twilight[verification needed — verify] though she hits harder and has a larger health pool. Once she is dead, you can head over to Stibbons and free him. He will then run out of the room and down the stairs. Many of the daedra will have respawned so you will likely need to fight your way out. Once outside, follow the road eastward until you reach the Shrouded Plains Wayshrine where Stibbons will be waiting for you. Stibbons will then gift you some gold and a pair of dress trousers which can be sold for extra money. If you miss the notes, they can be found on the ground near to the Shrouded Plains Wayshrine after the quest. This quest counts towards the number of rescued individuals needed for The Army of Meridia. After completing this quest, you may notice that Stibbons does not make his way back to the Hollow City. You'll find him again at the Manor of Revelry. Finishes quest I rescued Stibbons from the tower. I should meet him at the wayshrine to the east and make sure he's all right. This page was last modified on 3 February 2019, at 08:26.